Media is the new military in India today. TV stations are barracks and war rooms, where the discussions are not based on news but give pointers on how to wage war and defeat the enemy nation. Narendra Modi-ruled India is run by a militarised media that broadcasts not news but only jingoism and war hysteria. This has become the language of a large chunk of Indian media that had never demonstrated such blatant anti-minority, anti-Kashmiri, anti-secular and liberal bias. A systematic demonisation of Muslims, Kashmiris and sane voices in India has started after the Pulwama terror attack that claimed more than 44 lives of the Indian security personnel. The attack on Kashmiri students in different parts of India is the by-product of the jingoism and demonisation that the media has been indulging in and disguising it as national interest and security. Even the liberal sections of the Indian society are being attacked by the media. 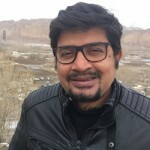 Some prominent journalists have been facing harassment online and offline for keeping a level head and questioning the government’s policy on Kashmir. Even the civil society members who are questioning the war hysteria are being called names and are labelled anti-national. One needs to see Indian talk shows to believe the kind of things I am referring to in this piece. 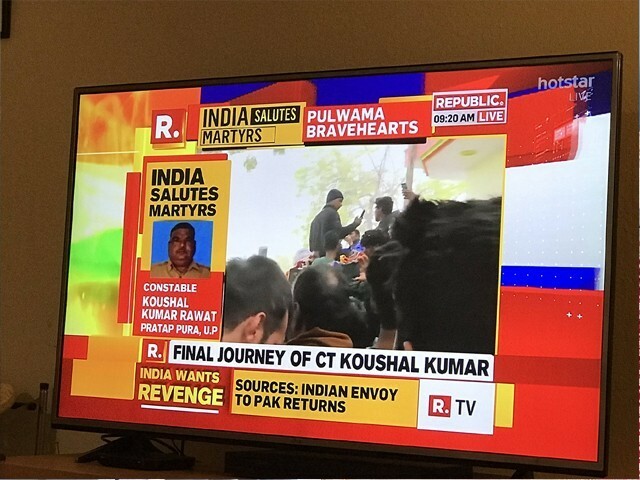 Republic TV, a channel that considers itself the guardian of the nation and its head commander-in-chief, has had the ‘best’ reaction. This does not, however, tell you the full story. The panellists were divided into different groups; for example, the ‘Pakistan will pay lobby’, ‘government to blame lobby’, ‘stop Aman Ki Asha lobby’ and ‘just lip service lobby’. The same jingoism could also be seen on Times Now, Zee News, ABP News, India Today, which are all widely watched channels in India. Unfortunately, the media, that is supposed to be the harbinger of truth, is busy fuelling the war fire. Things would have been different if the people calling for war were actually out there fighting themselves. Right now, they are just shooting off someone else’s shoulder. Been there, done that. Assembled body parts of my buddy & took him home, there were 6, I don’t know which mother got which part head/ heart of which cast/religion, part of my soul went with them. Stop talking revenge/war sitting on easy chairs. Fight terror in any way if you can. In one instance, Zee News was not willing to trust former soldier DP Singh when he talked about the pain of war and the need to engage Kashmiri youth in dialogue instead of allowing them to be radicalised. “Not illegal to go to war, it is immoral and inhuman to think of it as a solution…” said Colonel DPK Pillay. A large section of the media we see today has a majoritarian streak and they want to take the country backward rather than forward. India is reforming its economy and ushering in a new era of development and yet politically and intellectually we are moving towards modern medievalism. As a nation, we are losing our liberal sheen and democratic space. India blames Pakistan for the Pulwama attack because the terror group Jaish-e-Mohammed (JeM), which claimed responsibility for the attack, is based in Pakistan and its chief Masood Azhar is also holed up in the Islamic Republic. New Delhi uses this fact to whip up war hysteria in the country and shirks its responsibility in Kashmir. Having said that, it must be pointed out loud and clear that India is far more culpable than Pakistan. Can we deny the fact that the situation in Kashmir has been deteriorating for the last five years and it has reached a point where the educated youth are getting radicalised and taking up guns? Can the Modi regime escape the blame for creating such a vicious circumstance in the valley in the first place where youngsters are now ready to die to kill? Can we deny the fact that New Delhi’s muscular policy has been forcing Kashmiri youth to carry out such attacks? His Bharatiya Janata Party (BJP) has been at the vanguard of directing the Kashmir policy both from Delhi and Srinagar for more than four years. The ruling Hindu right-wing cannot escape the criminality. Pointing fingers at Pakistan is not the way forward in Kashmir. But the government and the media are only concerned about the ‘larger interests’ of the nation and the society – taking down the enemy. The Indian PM didn’t issue a single statement requesting the people to stay calm in these dire times. He did not ask the state governments to protect the personal and physical safety of Kashmiris living and studying in different parts of India. There is not a single condemnation from the government when the Kashmiris were attacked in Indian-occupied Kashmir (IoK) and other parts of India. It’s the civil society and members of the Sikh community which came in defence of the helpless people. A BJP-appointed governor of the North Eastern state of Meghalaya, Tathagata Roy, called for the boycott of Kashmiris and Kashmir. It’s been more than four days and no word of condemnation has come from the ruling party. It speaks volume about the mindset of the ruling party of India. If the Kashmiri youth are getting radicalised because of the muscular military policy and lack of dialogue, the Indian middle class is also becoming a prisoner of bigotry because of the majoritarian politics of the BJP and its pet media houses. If the voices of moderation and sanity are muzzled in the TV studios of the militarised media, they are also in minority in the mainstream society. And the government is no longer an agent of sanity and justice. When the government talks about the revenge, it means governance is not in the agenda. By whipping hyper-nationalism, it hopes to cash in on the upcoming General Elections. But the question is not just about one General Election; the question is about the direction India is taking.